Finally a homemade pie crust doesn’t tear easily and is super easy to work with! I love that it doesn’t require chilling and uses butter, not Crisco. You know the saying ‘easy as pie’? Well, this recipe makes that reality because it truly does make pie making easy! 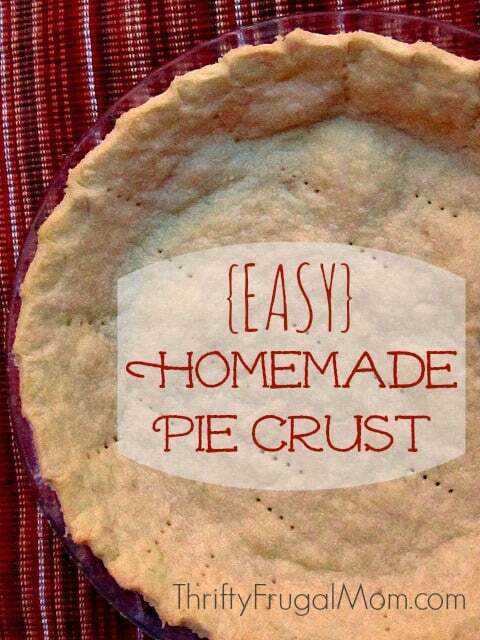 Several years ago I created this easy homemade pie crust recipe after getting frustrated with the Never Fail Pie Crust recipe that I had been using for years. Because for some reason, it wasn’t holding up to it’s name anymore and I was getting rather tired of the dough tearing every time I tried to make it. So I experimented a bit and came up with this recipe. I love that you don’t have to chill the dough before rolling it and I also love that it uses butter, not Crisco and as result is healthier. It also handles well, doesn’t tear easily and makes a wonderfully, delicious flaky crust. You’ll see that the recipe makes 3 crusts. If you don’t need 3 pies at one time, simply freeze the other crusts. You can freeze them baked or unbaked. Also, I can often get a fourth crust out of the scraps that are leftover from the other 3 crusts. It doesn’t look as nice, but it works. Another thing you can do with the scraps is to combine them all into a ball, then roll the dough out. Cut it into smallish pieces and spread jelly on one half. Then fold over the top and pinch the sides together to make a pop-over of sorts. I like to also sprinkle a bit of sugar on the top. Then bake until lightly brown. So yummy! If you are new to pie making, you might find Eat Your Heart Out’s pie making tutorial helpful. Oh, and I highly recommend getting a Pastry Blender (this is the one I have) if you don’t have one. It’s making working the butter into the dough super easy. A flaky homemade pie crust that doesn't tear easily and is super easy to work with! Simple enough that anyone can make a pie totally from scratch! Combine milk, water, and oil, then sprinkle in, tossing with a fork until mixture is moistened. Do not over-mix. Divide into 3 pieces; form into balls. Roll out crust on lightly floured counter and use as desired. If you want, combine scraps and create 4th crust. If you need to use this in a recipe that needs the crust baked first, prick the sides and bottom of the crust several times with a fork (helps prevent shrinkage) and bake at 400 degrees for approximately 10-12 minutes. * If your crust does happen to tear a bit, simply push the dough together, dampen your finger with water a bit and “seal” it. It should hold without any problem. * You can also make homemade Pop-Tarts with any leftover dough scraps. Simply roll dough out as evenly as possible and spread half with jelly. Flip the un-jellied dough over top and sprinkle top with sugar. Bake with your other pie crusts. Yes, Dustin, you can freeze them baked or unbaked. If unbaked, just let them come to room temp before using. Can I use white whole wheat flour to make it even healthier? Or will it not turn out the same? That's a good question, Brenda! I have subbed part whole wheat flour in other recipes, but never thought of doing it with pie crust, so I'm not entirely sure how it would work. My guess is that it wouldn't take as much flour and that it wouldn't be quite as flaky. If you want to try it, I'd recommend trying it with 1/4 whole wheat flour first just to see how it works and then increasing from that amount. If you do end up making it with whole wheat flour, I'd love to know how it works for you! Do you think I could use olive oil instead of vegetable oiL? I've never done it before, but I wouldn't be too scared to sub it as long as it's not a strong tasting olive oil. The only thing it might do is mess with the crust consistency a big. If you do it, I'd love to know how it works for you!